There’s a lot of competition these days in the vacation rental realm and as time wears on, it will take more and more to stand out among the crowd. There are a number of things you can do to improve your chances of landing guests like creating your own website and listing your place as pet-friendly. One of the most helpful things you can do, however, is keep learning. Watching the trends in the industry will help you know how to market your own place and grow a stronger business. There are plenty of things out there to keep you informed, from blogs to books and beyond. Podcasts are also a great source for gaining information. Firstly, you can listen anywhere and while you’re doing anything. Whether you’re driving, walking the dog, or on an airplane, podcasts give you the freedom to do and go wherever you like. Secondly, if you’re not much of a reader, they’re a real boon. Podcasts are a great way to take in information without having to give your entire focus. Get Paid for Your Pad (GPFYP) is the podcast for all things vacation rental hosting. Though the episodes often focus on Airbnb, much of the content applies to other vacation rental platforms. Creator Jasper Ribbers shares all the knowledge he’s accumulated over years of trial and error and combines what he’s learned with the expertise of others through interviews. Cottage Blogger started after author Heather Bayer wrote and published her successful book, Renting for Profit, in 2003. As the industry began to change and more and more folks reached out to Bayer for advice, she realized she needed to do something more. Just two years after the publication of her book, Cottage Blogger was born. The Vacation Rental Success podcast came a few years later and has been running strong ever since. The show is hosted by Bayer herself and often invites guests to share their expertise. Suffice it to say, you’ll find more than a few nuggets here to help you in your vacation rental venture. Bigger Pockets deems itself an “education site” and a thought leader in the real estate industry. In reality, it’s much more than that. It’s a place to network, a place to learn, a marketplace… You get the picture. Bigger Pockets gives you an opportunity to learn how to be a better, smarter business person. You’ll learn more than you realize and if you’re looking for others to continue the conversation, you’ll have a built-in community at your fingertips. This isn’t a vacation rental-specific podcast but it’s sure to inspire you each week. Mike Dillard hosts Self Made Man and invites big-name guests like Mike Rowe, Daymond John (of “Shark Tank”), Tony Robbins, and Lewis Howe to share their wisdom. 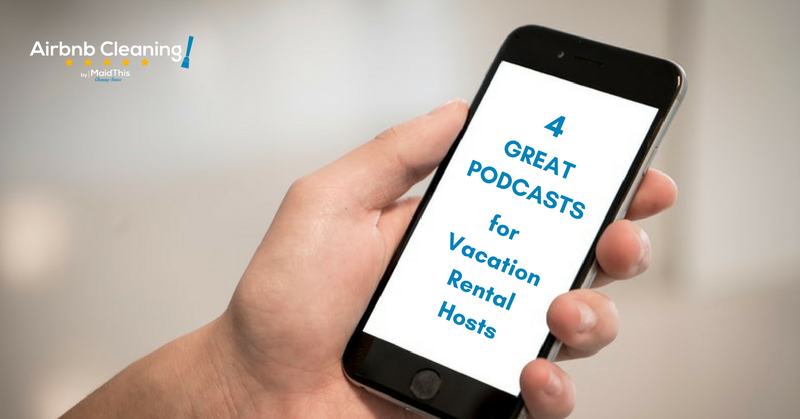 If you want to improve your business – and make no mistake, as a vacation rental host, you are running a business – this podcast is chock full of valuable tips. You don’t have to be a podcast nut to get something out of these shows. Even if you choose just one and tune in only sporadically, you’re sure to gain some valuable insight into how to improve your guests’ experience, your hosting business, and much more. Looking for ways to simplify your vacation rental business this year? MaidThis! can help! Avoid the hassle of turnover cleanings – let us handle them. *Our CEO, Neel Parekh, was interviewed by Jasper Ribbers on Get Paid for Your Pad in May 2017. You can listen to that episode here.